This is how I usually eat. I throw chopped veggies in a my favorite ceramic skillet, add a generous dollop of ghee, and add some meat and/or eggs in at the end. My meat + veggies + skillet equation means minimal clean-up, lots of flavor, and stick-to-my-ribs-nutrition. It also entails my favorite form of therapy: preparing and chopping fresh vegetables. Am I the only one who finds this daily ritual a restorative meditation? 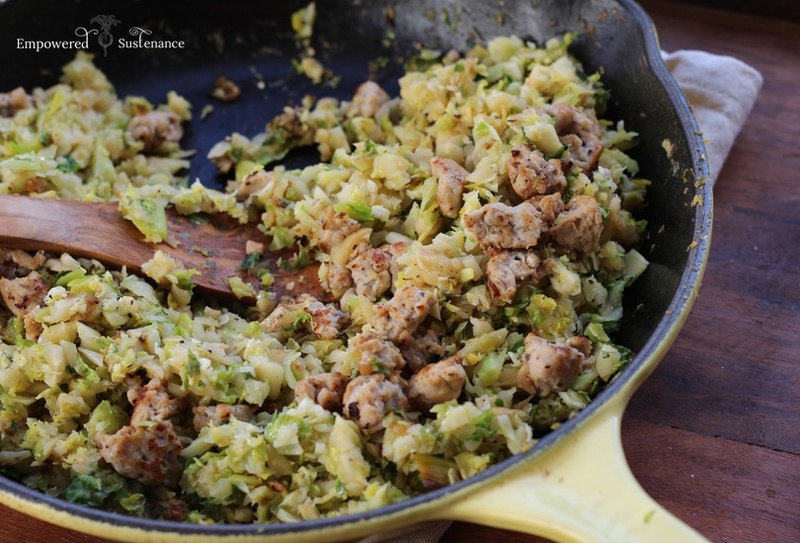 This Sausage and Brussels Sprouts Hash features a duo of satiating winter veggies: parsnip and Brussels. Feel free to use onion instead of leek or add in some bacon (well, duh add in the bacon!). My food processor attachment to my beloved Ninja blender makes quick work of chopping the veggies. 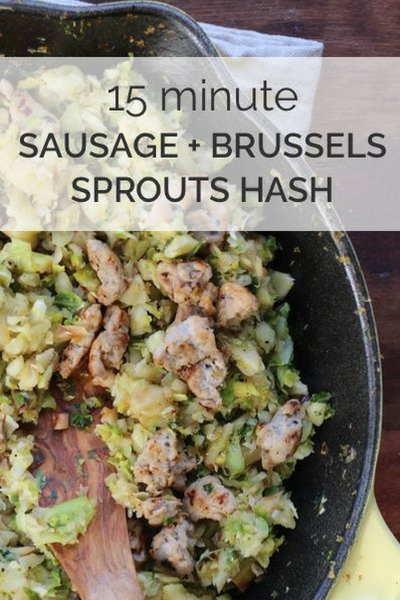 You could also grate the veggies, but that would certainly pose a risk to your fingertips with Brussels sprouts. The food processor is what makes this a 15 minute skillet, anyway. 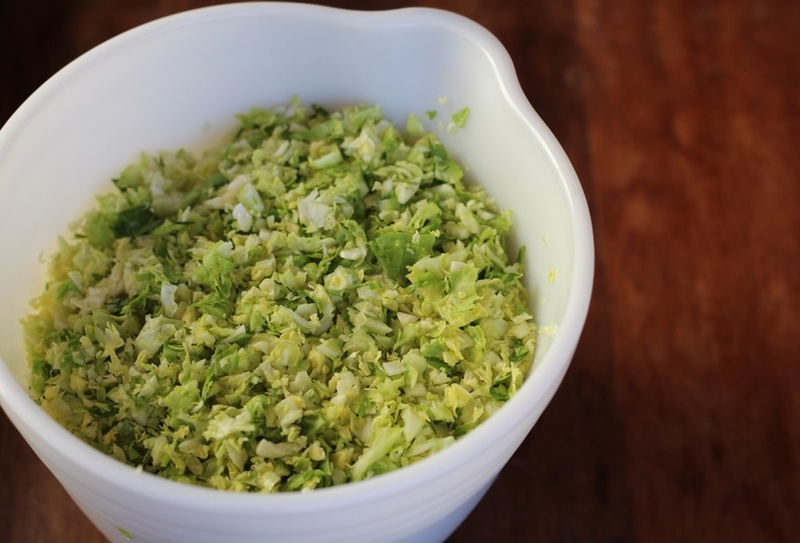 The Brussels will resemble green cauliflower rice after being pulsed, and will cook quickly. This one-pot-wonder meal uses only a handful of ingredients. Top with over-easy eggs for an even heartier meal, and enjoy for breakfast, lunch or dinner! In a skillet, start cooking the leek in the ghee over medium heat. Meanwhile, throw the brussels into a food processor and pulse briefly until it resembles rice-like grains. Transfer to a bowl and repeat with the parsnip. Once the leek has softened, add in the brussels sprouts and leek. Add the splash of broth and partially cover, stirring frequently, for about 8 minutes until the veggies are crisp-tender. Stir in all the seasonings (dijon, maple, salt, thyme). Place the veggies aside in a bowl. In the skillet, cook the sausage until done. Add back in the veggies. Serve and enjoy! If desired, make some over-easy eggs to serve atop the hash. Delicious! My husband loved it and didn’t even know he was eating Brussels sprouts! I’ve never thought to use brussels sprouts like this, but it’s such a good idea. Will definitely be giving this a try soon. How do I reach you? I like what you offer on breakfast and general recopies? Could frozen Brussel sprouts work in this recipe? I’ve made this many many times. I tend to sub salmon for the sausage nowadays and it is fantastic.